Get ready for a weekend of rad riding at Bear Mountain Canada Cup XC Race! The Canada Cup series is designed to provide competitive opportunities to the next generation of cyclists, transitioning from provincial race series to international competitions. The 12 km Canada Cup Trail is not for the faint of heart. Developed in partnership with The Southern Vancouver Island Nature Trails Society (NTS), the Canada Cup Trail is designed as a single track trail for advanced mountain bike skills. Anyone can compete with categories ranging from Elite Men and Women to Masters 50+ Men and Women. Registration closes on Friday march 4th at 5pm. Register here. Come Ride the Bear or just come watch and cheer on the national team athletes as they compete for a spot on their Road to Rio! The 2016 Canada Cup XC Race on Bear Mountain racing schedule and fees are as follows. Online registration has ended but you can still register on site until Friday March 4th at 5pm. For more information about the race, download Cycling Canada’s Canada Cup Technical Guide. After the race, put on your party shoes and join us for the “Road to Rio” Gala. Bear Mountain Resort will be hosting the gala to raise funds for the national team’s trip to the 2016 Olympic Summer Games in Rio, Brazil this summer. The inaugural “Road to Rio” fundraising event will feature a gourmet dinner, live and silent auctions and exclusive opportunities to engage and interact with Canada’s national team and development level mountain bike athletes. I’m excited to be attending the gala for the 2016 Olympic Spirit Project, I hope to see you there in support of our Olympic Mountain Biking Team! Canada’s top mountain bike riders, including Rio-bound Catharine Pendrel, have been training regularly at Bear Mountain Resort this fall and winter. The Resort, which uniquely offers year-round training opportunities on Canadian soil, is playing a key part in Cycling Canada’s long-term athlete development plans. As an outdoor adventure destination for the entire region, the Bear Mountain Trail System offers people of all ages and abilities access to nature and the marvelous recreational opportunities it has to offer. The resort is host to an expanding trail network, jump park, national team training centre and the annual BearTrax competition. The resort also offers bike rentals, coaching and guided rides through the Hub. For more information about mountain biking at Bear Mountain Resort, visit the website. You’ll find Middle Beach Lodge at the end of Mackenzie Beach Road in Tofino, BC on Vancouver Island. I headed here a few weeks ago with a group of girlfriends for a much needed weekend of beach walks, food, wine, and relaxation. Tofino is always a perfect weekend getaway destination for friends, a girls getaway or a romantic retreat. The Pacific Rim Highway to Tofino is twisty and windy and on this particular Friday afternoon, it was raining so hard that I literally drove through waterfalls cascading off the rock walls along the roadside. So depending what time of year you plan to travel to Tofino, be prepared for crazy road and weather conditions. Coming from downtown Victoria on the southern tip of Vancouver Island, the trip took about 4.5 hours. My friends came over on the ferry from Vancouver (a 1.5 hour boat ride), the drive from Departure Bay in Nanaimo taking them approximately 3 hours. When I arrived, my friends had already staked their claim to the two couches in the lounge in front of the giant fireplace of the Middle Beach Lodge public lounge. It was cozy and comfortable and when we weren’t out exploring the beach or the town of Tofino, this is where we spent the majority of our time catching up over tea or wine and relaxing. There were several couples at the Lodge, enjoying a romantic storm-watching weekend getaway. Our rooms at Middle Beach Lodge were small but comfortable. Our adjoining rooms both included a queen bed, in-room sink and vanity and a bathroom with toilet, tub and shower. Perfectly simple with everything we needed. But what really made the room was the view of the ocean and the sound of the crashing waves just outside the window! Hello Tofino! I’m so looking forward to spending the long weekend with you! Our stay at the Lodge included a continental breakfast, including croissants, cinnamon buns, toast, meat and cheese plate, hard boiled eggs, cereals, yogurt, fruit and more. Plus, of course, your standard coffee and tea. My favourite food part about our stay was the fresh cookies they bake mid-afternoon each day. Deeeelicious! We had a mix of weather conditions from stormy wind and rain to clear sunny skies. I highly recommend bringing your rain gear to Tofino any time of year, as it is on the edge of a rainforest on one side and the open ocean on the other. This combination makes the weather unpredictable and susceptible to quick change. 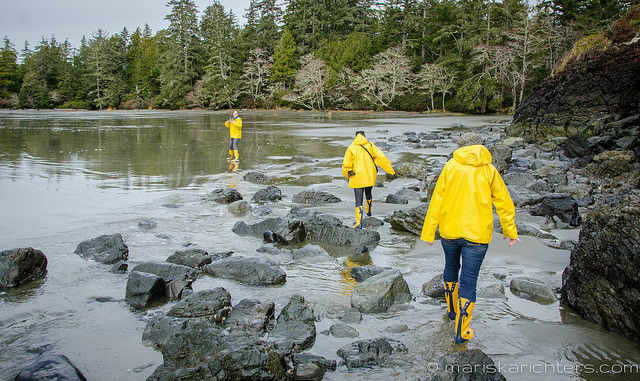 If you plan to stay at Middle Beach Lodge, they have a healthy supply of bright yellow rain coats and rubber boots for guests to use during their stay. When we saw this, of course we HAD to wear them! 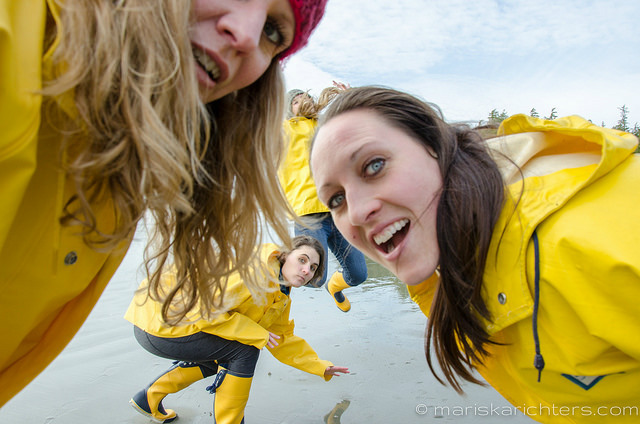 So the four of us traipsed down to the beach in our yellows for a photoshoot! See more photos of Middle Beach Lodge here and more Middle Beach Photoshoot pics here. A while back, we were invited to stay at Wits End Retreat for our first bed and breakfast getaway together. Every aspect of our stay exceeded our expectations! From the location, to the grounds and accommodation to the food, our experience was outstanding! The grounds of the B&B are absolutely stunning with perfectly manicured lawns, huge trees, beautiful flower gardens, herb gardens, an organic vegetable garden, fruit trees, a cozy gazebo, fountains and several several garden seating areas throughout the property. The open concept, garden-view room has a cabin feel with a queen size bed and fireplace on one end and a living space with love seat, comfy chair and coffee table on the other. Included with the room was a bottle of wine and cheese plate with crackers, a mini fridge stocked with cold drinks, and the best part: pastries! Not far from the B&B we discovered a gorgeous white sand beach at Witty’s Lagoon, which completed the vacation feel for us! We were so fortunate with the warm sunny weather during tour stay that it almost felt tropical on the beach. Our morning breakfast was insanely delicious! Prepared by the chefs of Wits End Catering, we enjoyed poached pears to start followed by eggs benny with incredible local Metchosin sausage. Oh my DELICIOUS! Even though this B&B is only about a twenty minute drive from our home, we felt like we were far far away on a beautiful romantic vacation getaway. It was absolutely perfect! Thank you to Sandy and Heather for your kindness and generosity and for sharing your little piece of paradise with us! We will most definitely be back for another romantic escape in the future! I had read some of the glowing TripAdvisor reviews prior to the weekend and our experience fully exceeded my expectations! You’ll find Wits End Retreat at 517 Witty’s Beach Road, Victoria BC. Make your reservation online or contact them by phone (1 250.474.1066) or email ([email protected]). This weekend (July 31 to August 2, 2015) I will be up at Bear Mountain Resort for the BearTrax Freeride Mountain Biking Festival contributing social media and photography services to the event. BearTrax at Bear Mountain is the biggest biking event (so far) that the resort hosts annually. BearTrax (formerly known as Jumpship) will showcase some of the world’s best freeride mountain bikers, most of whom will move on to compete at Crankworx in Whistler, BC next weekend. This FREE family-friendly event includes a kid-zone with bouncy castle for the kids, a beer garden by Vancouver Island Brewery for the big kids, iRide clinics for the kids from CyclingBC, air bag for amateur riders, and all kinds of vendors, food trucks and DJ Bellyfish to keep the tunes pumping. You will also have a chance to win a Rocky Mountain Soul 27.5 mountain bike over the course of the weekend by getting your Instagram on! All you need to do it follow @RockyMountainBicycles and @BearMountainBikePark on Instagram and tag your best #BearTrax shots from the weekend with #RideTheBear to enter. The winner will be announced on Sunday, August 2nd 2015 by North Vancouver mountain biker, Brett Tippie at the awards ceremony. For more information about the riders who will be participating, visit the BearTrax page on the Bear Mountain Resort website. So come and #RideTheBear at Bear Mountain Resort in Victoria this weekend! And if you see me up there, don’t be shy! Come on over and say hello! Earlier this month I traveled to Vancouver for 3 days to photograph the Access Sport Recruiting and Training Showcase2015 event. Access Sport helps high school students plan for a sport oriented college / university experience. They coach Canadian student athletes from grades 9 to 12 through the recruiting process in both the NCAA and CIS. The Showcase2015 event brought students from all over British Columbia and Alberta to Wright Field at UBC to showcase their field hockey skills to coaches from universities all over North America. Athletes had the opportunity to personally connect to college level coaches and recruiters in the NCAA and the CIS. They learned all about college playing schedules, how to plan to attend the school of their dreams, and how to do it all on a fully funded scholarship. In addition to the three days of seminar and on-field training, athletes received a full year of membership to the Access Sport Recruiting Profile included in their tuition, and access to an on-field athletic trainer for the duration of the showcase. For more information about Showcase and Access Sport, or to get your own online recruiting profile, talk to Jenn Beagan at access-sport.ca. Access Sport will be hosting a fall conference later in 2015 – stay tuned to their Facebook and Twitter pages for details as they become available. Spend a Night in the KLM Airplane Apartment! The Dutch have done it again! I’ve always been a fan of KLM Royal Dutch Airlines. The airline was practically part of the family back when my Opa (grandfather) was a pilot with them and I do my best to fly with them (or their partners) whenever I travel. The airline has come up with some great marketing campaigns in the past, but as an avid traveler, I think this one is just awesome! KLM has come up with a super fun idea to give a few lucky winners an opportunity to spend a night on one of their planes. This is not just any plane – they’ve converted a McDonnell Douglas: MD11 into a spacious apartment and have listed it on Airbnb! The plane accommodates four people in two bedrooms with three beds and a whopping eight (yes 8!) bathrooms! (That’s two bathrooms per person!) There is also a kitchen on board, a television, wifi connection, gaming console, and of course comfy first class chairs to enjoy aviation-themed films (including Top Gun and The Aviator) on the entertainment system. It’s FREE to Stay in the KLM Airplane Apartment! Yes! That’s right! It’s FREE!! But there’s a catch. You will have to convince KLM in 100 words or less why they should choose to fly you to Amsterdam to stay in their airplane apartment on November 28/29 or 30, 2014. Don’t use the inflatable emergency slide. Smoking is not allowed when the non-smoking sign is on. No marshmallow roasting with the jet engines. Please water our plants and feed our fish. The consumption of alcohol is not allowed. Please treat our plane like you treat your own plane. Go to the Airbnb listing and click Contact Host. Next choose a date and write your 100 words (or less) explaining why they should choose you and who you would bring with you. It’s that easy! The deadline to enter the KLM Airplane Apartment contest November 20. I’m going to head over and submit my own application right now, because I think this contest is just fantastic! Remembrance Day 2014. A time to reflect on all of those who suffered through the wars of the past and present and all of those who sacrificed their lives for the freedom of others. On this Remembrance Day 2014 I remember the sacrifices of my family and those who fell so that we may have freedom. My dad was born in the Netherlands during WWII. He doesn’t remember it because he was just a baby. My grandparents rarely spoke about the War. I can’t even imagine the horrors and atrocities that they experienced and the loved ones that they lost. What I do know is that my grandmother lost her brother to a lineup in a concentration camp. My grandfather (who I never met) was a minister and was one of the few people who were permitted to travel around freely to perform religious services. When my grandmother passed away in 2012 we found letters that my grandfather had written to her during WWII; they were sweet yet heartbreaking. We also found permission letters from the Germans allowing him to travel by bicycle at certain hours to perform religious services, but curfews were strictly enforced. My grandmother also had a collection of underground newspapers that could have gotten her into a lot of trouble had anyone found them at the time. The untold history that we lost with my grandmother two years ago is incredible, but I can understand why it’s not something she spoke about. I can’t imagine what she experienced during those years and I admire her strength to get through it. I am so thankful for all of those who gave their lives so that we may live in peace. 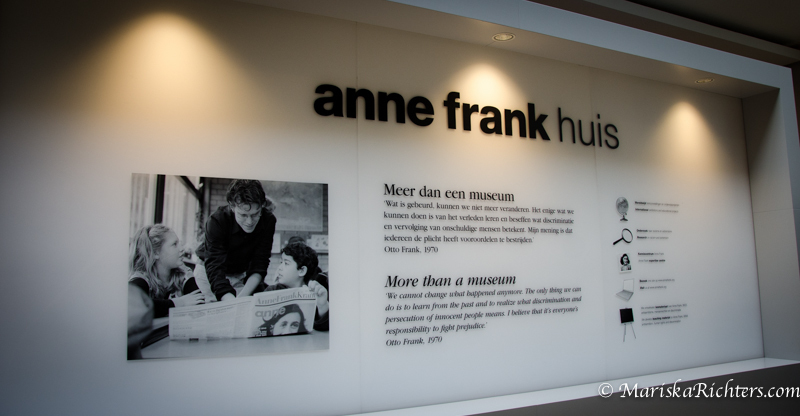 Visiting the Anne Frank Huis in Amsterdam drove the reality of WWII home for me. 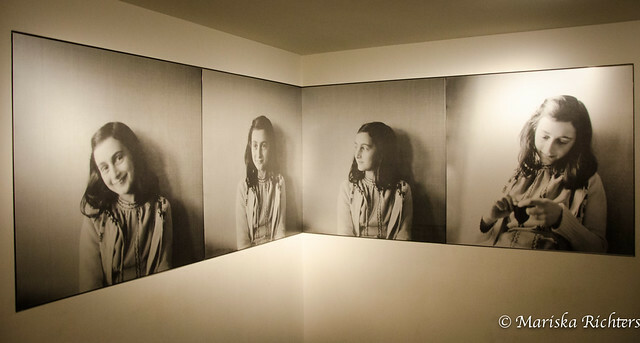 Being in the house where Anne Frank and her family lived in secret was such an emotional and humbling experience. I first read Anne Frank: The Diary of a Young Girl years ago and I still remember the impact it had on me. 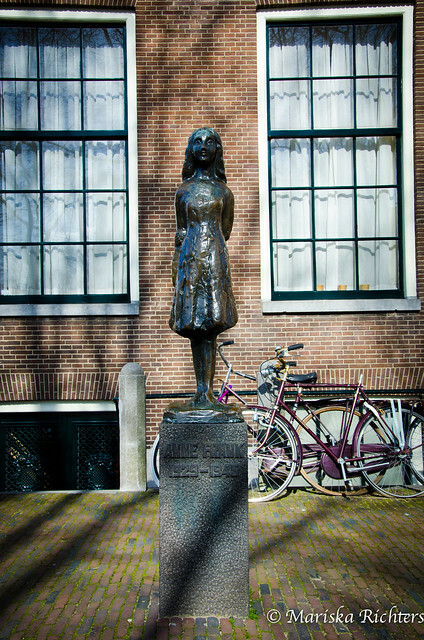 To imagine myself in Anne Frank’s position, at age 13, living in the attic of this house with eight people while in constant fear of being discovered is simply unimaginable; and to be standing in the very rooms where she wrote her diary was surreal. What I find most admirable though, is that Anne was still able to enjoy the simple pleasures and beauty of life. If you haven’t read The Diary of a Young Girl, I highly recommend it, you can find it here. The world was such a different place back then. I am so grateful for all of those who had the courage and strength to give their lives so that by the time I was born, less than an hour’s drive outside of Amsterdam, my family had the opportunity to live in a better world. It gives me chills to think of the history that my grandparents lived through. On this Remembrance Day 2014 I remember the sacrifices of my family and those who fell so that we may live a life of freedom. This time last year I had just landed in Costa Rica for my first Central American adventure. I found Costa Rica to be an incredibly beautiful and friendly country and of all the places that I’ve traveled it was the first place that I felt I would be able to call home. As I look back at my photography from my travels, I wanted to share the photos in a way that would allow others to enjoy the beauty of this amazing country as well. With this in mind, I’ve decided to celebrate the scenes of Costa Rica and the Pura Vida Lifestyle through the 2015 Costa Rica Wall Calendar featuring images from my travels. I’ve included a few shortlisted images below. If they inspire you I invite you to pre-order your very own 2015 Costa Rica Calendar today! Calendars ordered by November 26th will be printed and shipped (to Canada and USA) in time for Christmas.